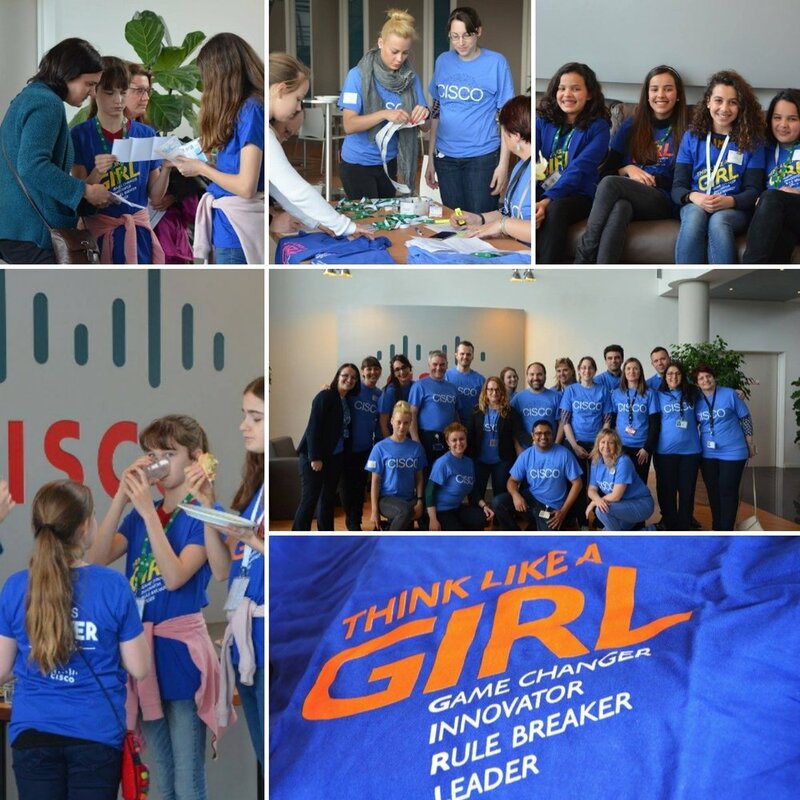 Cisco and g4g came together to support the Global Girls in ICT Day initiative by welcoming a group of girls for an afternoon of Arduino technology & cyber security at Cisco offices in Brussels! A special group of 25 girls aged 11-15 had the chance to have one-on-one mentorship and inspiration with Cisco employees and Women of Impact attendees! What? We welcomed 25 girls aged 11-15 to a g4g@work event at Cisco for an afternoon of hands-on, interactive, & technology-driven workshops! How? 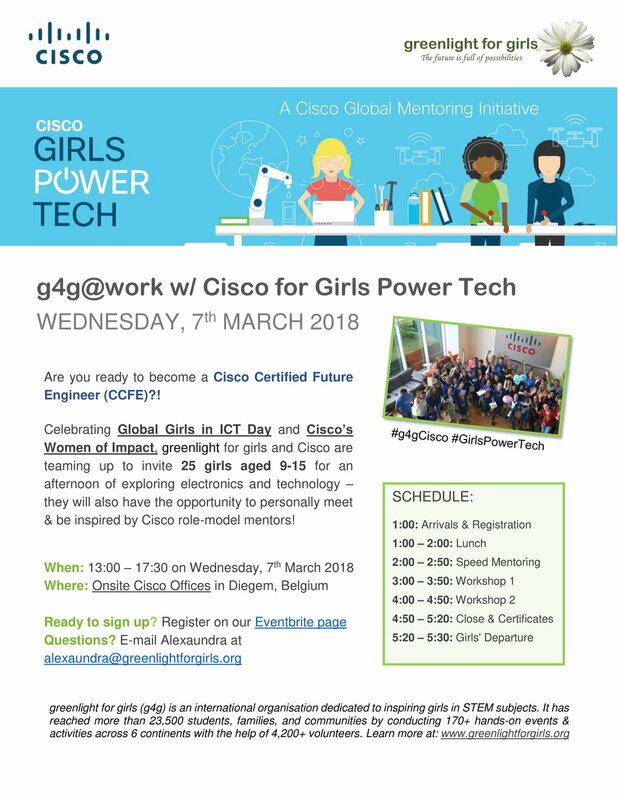 We invite role model professionals to lead 45 minute workshops that show the link to STEM and highlight the technology that Cisco is known for, with 10 - 12 girls in one workshop. At the end of the afternoon, girls became Cisco Certified Future Engineers! Lucy Reynaud is an Aussie expat married to a fabulous Frenchman and has with 3 young children who were each born in different countries. She’s an all or nothing girl, therefore most likely to be found either out training for a half marathon… or lazing around reading her third book this week. She is a Gemmologist and Diamond Grader by profession, a total nerd, and likes to think of herself as a semi-professional dumpling & massage tester too. On Wednesday 7 March, greenlight for girls teamed up with Cisco for a g4g@work day, linked to International Womens Day where Cisco professionals and Women of Impact guided the girls with hands-on learning and training, and sat down with them for some one-on-one speed mentoring. One workshop was on Cyber Security where the girls learned about network data protection, monitoring, and what happens when you get hacked. The other workshop was on Electronics and the Internet of Things - the girls learnt how we can connect anything on the internet and the difference that will make in our lives tomorrow. Afterwards we had an Awards ceremony where each greenlight girl received a certificate and we had delicious snacks provided by Cisco! You can see the photo album of the event here! Last year, g4g and Cisco celebrated girls in tech by hosting our Girl Power Tech - g4g @work w/ Cisco in Brussels on May 3rd. Together, we welcomed 40 young, ambitious girls for an amazing, fun-filled day. They got to explore electronics, learned about Mars in a workshop inspired by the movie “The Martian” and got to learn from inspiring Cisco rolemodels, having the opportunity to ask them questions in a Speed Mentoring session. At the end of the day, all the girls became Cisco Certified Future Engineers! On April 27th, g4g collaborated with Cisco BeLux to invite 30 girls from the local community for Cisco’s Global Girls in ICT Day. The girls experienced three fun and hands-on tech-driven workshops and in the end of the day, they became Cisco Certified Future Engineers (CCFE)! So what did the girls get to experience? A popular workshop – Arduino electronics FUN – gave the girls an opportunity to build their own creations, like traffic lights, and control the physical world via sensors and actuators; A custom-made Cisco workshop called “I’m a Router” where the girls discovered the basics of routing protocols and the logic that guides networking devices by building connections across the globe; “The Martian” Telepresence Technology – yet another custom-made Cisco workshop. The girls got to experience first-hand how cool cutting edge technology connects Cisco employees around the globe and how Mark fom Mars signals to his colleagues back on Earth! Finally, the girls went through the Cisco TAC Lab Tour that takes you through an amazing visit of one of Cisco’s largest labs, with tons of cool gear that can replicate any customer network in less than four hours! Special thank you to Aurelia, Lien, Jitka, Nele and Ann for leading the way to yet another successful event! On the 1st of April, g4g and Cisco invited 34 girls to the Cisco premises, giving them the opportunity to become Cisco Certified Future Engineers. Throughout the day, the girls got to build several skills, including codig , LED programming and telepresence technology. Watch out for these girls, as they are ready to take on the ICT world! Click here to see the whole photo album! Thank you to the Cisco team and all the amazing volunteers!